It is human nature to be reluctant about trying something new for the first time, whether it is a certain food, a form of exercise, a vacation adventure/destination, or a multitude of other examples. While some people may be rather open to new experiences, a great majority will often make excuses or assumptions about why they will not or cannot take part in a specific endeavour. What is interesting, and at times fascinating, about the latter group is the fact that their decision to decline, opt out, or not participate is based on perceptions, prejudices, or third-party attitudes. They do not actually have any personal experience upon which to base an objective opinion; it all tends to be founded on supposition/subjective evidence. This can frequently be the case with respect to purchasing and/or wearing hearing aids for the first time. There is a tendency for individuals to balk at the notion, or the value, of hearing aids due to pre-conceived biases or misconceptions; this is often fueled by so-called myths that they have perhaps read or heard from family members and/or friends. Therefore, the intent of this discussion is to debunk many of the common myths about hearing aids in order to help educate individuals, and their families, in situations where these devices are being recommended for the first time. 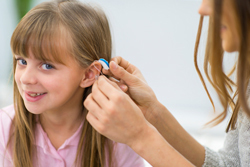 Note that, although there are certainly many myths and misunderstandings about hearing loss, the emphasis here will be limited to those most common to the devices themselves. The importance of debunking the latter myth should not be underestimated. Although it may be easier, faster, and less expensive to order hearing devices online, it is likely that they will be more generic in nature, designed to provide a basic amount of help to a wide range of patients, in much the same way that drug store magnifiers/reading glasses can help people read the fine print on a package or an application form. There is a reason why prescription glasses are made for a specific individual i.e. to assist with their established vision needs. For the same reason, hearing aids must be designed relative to the documented degree of hearing loss for the individual patient, and this can only be ascertained and addressed by trained professionals, like the hearing specialists from Bravo Hearing Centre in Toronto. For many people and their families, dealing with hearing loss or impairment will be a fact of life. Fortunately, in a significant portion of these cases, hearing aids will prove to be a viable treatment option. The Bravo Hearing Centre also offers a full range of hearing aid accessories and hearing-related services such as professional counseling, aural rehabilitation, and on-site hearing aid repairs. If you have questions or concerns about either purchasing or wearing hearing aids, call the hearing aid specialists at Bravo Hearing Centre in Toronto today at 416-207-9711 to book a complimentary hearing test and/or consultation at your earliest convenience.